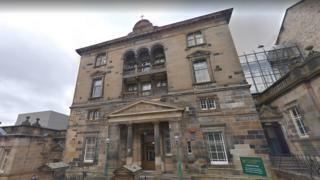 A former pupil of St Aloysius' College in Glasgow has said he was sexually abused at the school in the 1960s. The man, now aged 66, made allegations against two Jesuit priests, one of whom was a teacher at the college. Police Scotland confirmed inquiries were carried out in 2017, but there was insufficient evidence to pursue the matter further. The college said it has "clear and robust safeguarding ­procedures" in place. Patrick McGuire, a partner with Thompsons Solicitors, told BBC Scotland: "My client has spent the last 50 years in hell. "Only now has he felt strong enough to come forward. "He has taken that brave step and we want to do everything we can to obtain the justice he is looking for." Mr McGuire also urged anyone with similar experiences to come forward. Speaking to the Sunday Mail the former pupil said he was subjected to ­sustained physical abuse by another two teachers - a Jesuit and a lay teacher. He said the abuse started in his first year of attending the school, when he was 12 years old, and lasted around two-and-a-half years. He named two Jesuit priests to police who he said were involved in the sexual abuse, but officers later established the men had died years earlier. Detectives interviewed a third priest, who the man had accused of being involved in carrying out physical abuse, but he died last year. A fourth man, a lay teacher, was ­also ­interviewed but not charged. A Police Scotland spokeswoman said: "We can confirm officers received a report in 2017 of historical sexual abuse on a 64-year-old man, which occurred in the 1960s at St Aloysius' School. "Inquiries were carried out, however, there was insufficient evidence to report to the Crown Office and Procurator ­Fiscal Service." St Aloysius' ­College said: "We feel deep sadness for all victims of abuse. We believe there is no excuse for any child to be subjected to harm. "The college has clear and robust safeguarding ­procedures in place to protect the safety and wellbeing of our pupils." A spokesman for the Jesuit order, which administers the school, said: "The Society of Jesus in ­Britain takes the issue of any kind of abuse of minors with great ­seriousness. "We employ a ­safeguarding officer, answerable to an ­independent ­safeguarding ­commission. "Any allegations received of abuse by Jesuits, ­current or ­historic, are referred directly to the ­safeguarding officer, who will collaborate fully with ­statutory authorities, ­including the police, in the ­investigation and, where appropriate, the prosecution of such cases."